Have just been and checked and it is today – the first post on this blog was the 2nd Dec 2007. A lot has happened since then in my blogging world , I have made some lovely new virtual friends and have thoroughly enjoyed meeting new people from all over the world. I am now getting around 4,000 visits a month thanks to all the lovely people who have put links to me on their blogs.Have spent far too much time reading all the links I have found on other people’s blogs and marvelling at all of the loveliness out there.Thank you blogging world for all the fun! So to celebrate I am going to do a giveaway. 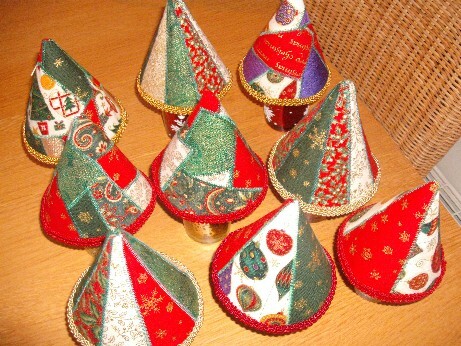 Since it is the season for it and you all know how much I like them the giveaway will be a selection of Xmas ornies and fabric. If you want to enter please leave me a comment – I will pick the winner a week from today on the 9th Dec to give me time to catch the last parcel posting date. Well like the rest of the UK we have lots and lots of snow! I have just logged on to the WordPress site to do this post and they have virtual snow on the page – not that we really need that as we have about a foot of it outside. As usual it has caused endless disruption at work and home – though lovely son Jake is very happy that college has been cancelled for the last three days and he has been able to stay in his room in the warm playing on his computer! Regular readers will have seen lots of pics of my garden in the snow so I am not going to post any more of those – suffice to say it is looking a lot prettier as the snow is covering up all the dead leaves! 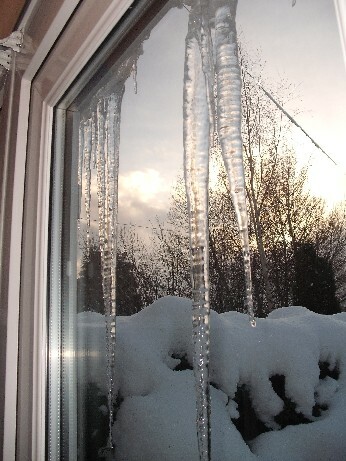 We have a new addition this Winter though as these amazing icicles have grown on the new conservatory roof. They must be about 3 foot long! Winter sun this morning - picture taken through the doors as snow is so high I can't open them! I have been busy finishing my things for the Xmas Craft Fair this weekend at Oakwell Hall . I am concerned that it might not be able to go ahead though because of the weather as lots of stuff is being cancelled. If so I am going to have a lot of little trees, baubles and pine cones going spare! 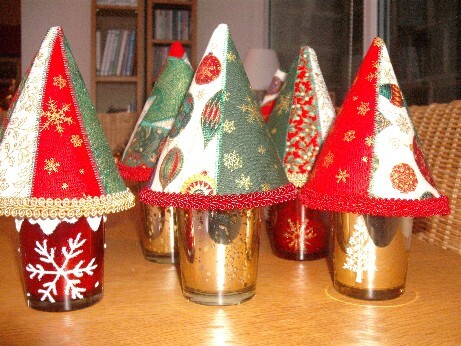 Here are the ones I have finished this week in their little pots – they just need the snowflake charms sewing on the top which I will do this evening. I have had to go with a range of pots as I couldn’t find many gold ones – these are a selection of votive holders that Ellie I and found by scouring all our local pound shops. I think that the red ones look really pretty as well, especially the ones with the snowflake design which were from Poundland. 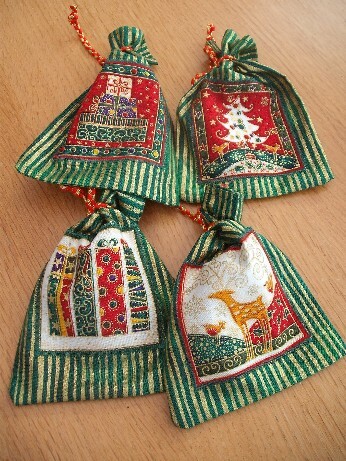 A little Xmas tree forest - I love all this fabric! I have great plans for ornie making for next year. I have made some more Xmas gift bags for this year using some ‘labels’ fabric which matches some of my other Xmas fabric which have worked really well and am thinking of extending this to make some quilted Xmas stockings. Have just taken delivery of a lovely new book (and of course I needed more craft books kids!) 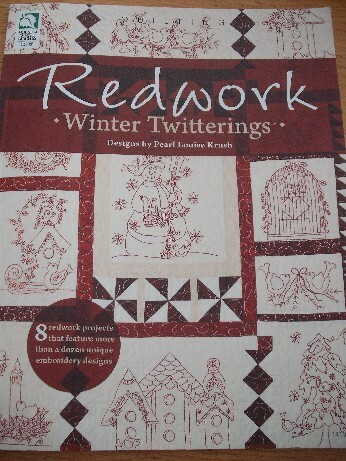 on Redwork called Redwork Twitterings by Pearl Louise Krush which has given me some good ideas. She has a quilt shop in the USA that I would love to visit as it looks so cute. Here are the pics on her Thimble Cottage web site . I would like to design some of my own redwork and incorporate that into some pieces. Look at that - Xmas fabric and embroidery - heaven! Looking on the bright side I do now have more crafting time because of the weather as a social event I was going to and cooking for has been cancelled and if the craft fair doesn’t go ahead I will have all of Sunday for textile loveliness – might do something with my new Xmas fabric – make it feel love and wanted! Hope you are all keeping warm and coping with the weather where you are.